While I’ve always been a thin gal, I am also, like many women, prone to pockets of stubborn fat that cling to my outer thighs. They irritated me all the way back in my days as a young dance student, when I often tugged on the sides of my thighs in an attempt to smooth my silhouette in the mirror. Most recently, I’ve acquired what I’ve taken to calling a “donut”—a small ring of pudge that encircles my belly button. (Hello, 35!) They’re small things, yes, but as someone who eats healthfully and exercises regularly, I’d like to feel more confident considering my efforts to stay fit. Liposuction has never been on my radar—it’s much too extreme—but when I got wind of a treatment in Midtown known for freezing fat away, I was all for it. The treatment is called CoolSculpting and it’s offered by Dr. Mark Beaty, a double board-certified facial plastic surgeon specializing in cosmetic and reconstructive surgery. CoolSculpting is a non-surgical fat reduction process that involves no needles or downtime. Targeted areas include thighs (inner and outer), abs, flanks (muffin top), arms, under the chin and that pesky “bra bulge” that plenty of women struggle with. Feeling hopeful, I make an appointment. On the day of my treatment, we start with a comprehensive body analysis. “We fully evaluate and personally optimize the treatment for the individual needs of our clients,” says Beaty. I learn my BMI, skeletal muscle mass and body fat percentages. Next, I suit up in paper shorts, and we’re off to treat my outer thighs first. My nurse, who has been trained at CoolSculpting University (a two-day certification seminar), has had the “maximum degree of training” on this machine, as do all of Beaty’s nurses. She uses a marker to trace around the CoolAdvantage applicator on my outer thigh. It looks like a big defibrillator connected to the machine and I’m hoping she’ll bring my thighs back to life with a more slender silhouette. Next, she places a gel pad inside the outline and wraps the applicator tightly around my leg. Feeling a serious squeeze, I wonder what I’ve gotten myself into. She assures me that the pressure allows for optimal results, so I soldier on. For 75 minutes while my fat freezes, I lie back in a reclining chair and catch up on episodes of “Chelsea Handler.” I have two more cycles to go—one cycle equals treatment to one area, and my other thigh and belly are up next—so I know I’m in it for the long haul. 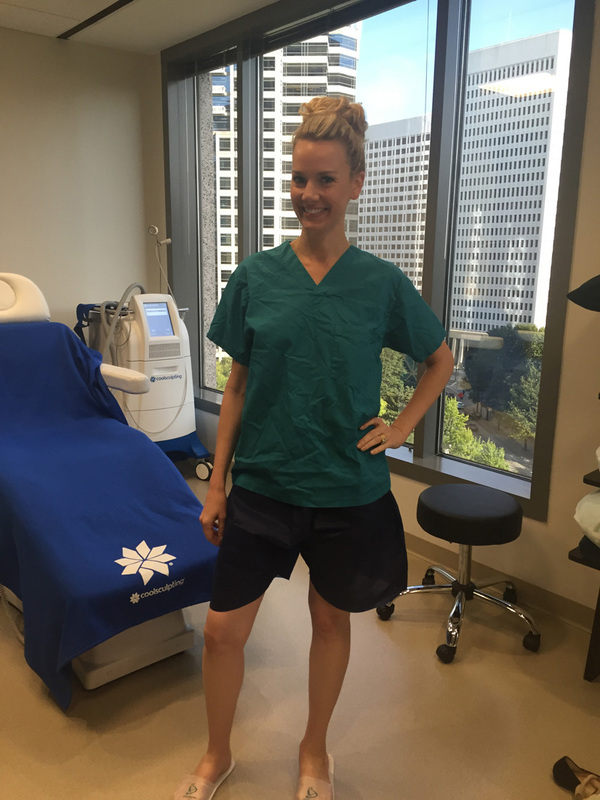 While I wait, Beaty breaks down the science behind CoolSculpting, which starts around $700 per area and is tailored to patients’ individual needs. When the cycle of one thigh is finished, a three-minute massage follows. My nurse tells me that “everyone hates this part,” and I understand why; it feels like razor blades. This discomfort is due to the skin rapidly getting blood flow back to the area— just like when a foot or limb falls asleep. Sometimes beauty is pain, but luckily it’s over before I know it. Before I head out, Dr. Beaty tells me that it it can take up to three months for CoolSculpting results to fully realize. Eight weeks later, I notice that my treated areas do, indeed, look more streamlined than before. “Cool,” I think. I’ll take it.